the nigerian episode was simply luck of unpreparedness by the host. ever since i started following gor football and that was way back then, one trend has always been evident. so long as ur going to play in the arab countries(except morocco na egypt) and the other francophone countries then be prepared for the worst. bad treatment is part of the trade. of all the places gor went in french africa, it was always bad treatment. on the contrary, the english speaking countries have never had this trend. nigeria has always accorded kenya good treatment, so what happened in nigeria on my view was not intentional. 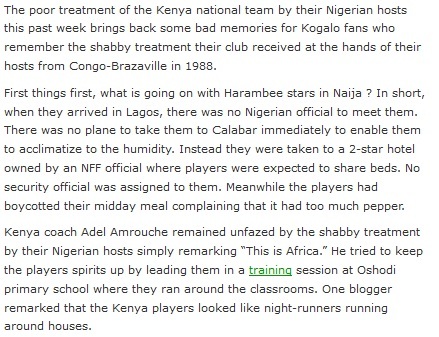 furthermore nigeria has never viewed kenya as a threat in football( and this is a fact) so to use such tactics would be really supprising. 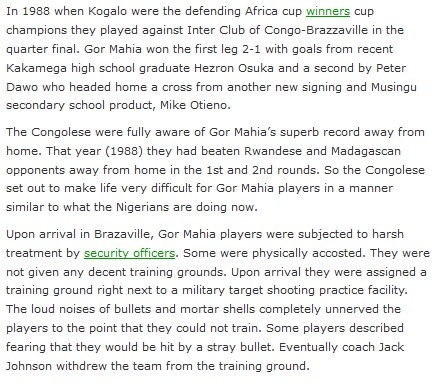 gor on the other hand was a threat everywhere it went.add that CAF was francophone, so needless to say these countries knew they would get away with murder. 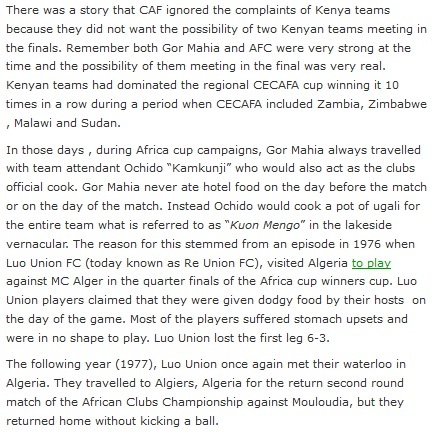 when gor took the cup after defeating esperance is an example of such bias. 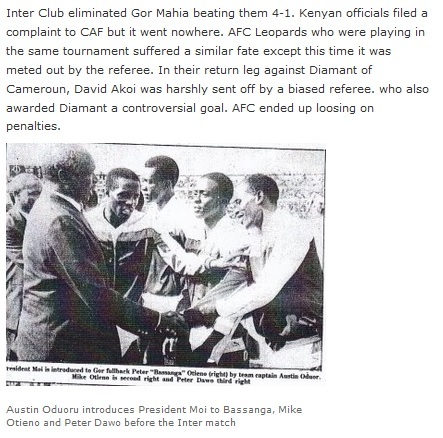 what we so being done to peter dawo has never happened in soccer before. but the referee never cared. the defender even tried gouging dawo’s eyes out! isaiah omondi actually chased one esperance player around the field. 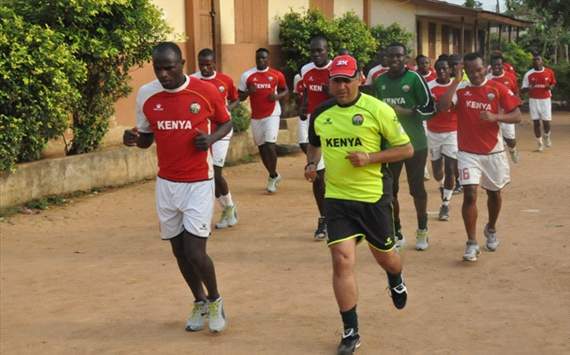 the francophone countries are the worst places kenya can play. so congo(brazaville),togo,algeria,tunisia,mali,senegal are countries that the respective football authorities intentionally use bad reception as policy. the CAF president has never liked kenya and is still revenging for the years kenya supported seff blatter, so pls expect zero sympathy. the nigerian supporters are known to be cruel in terms of arrogance etc but poor reception, by the authorities, has never been one of them. gor during it hey days played bendel(nigeria) and no such experiences were reported. I tend to disagree with #1 above, during the 1998 world cup qualifier btw kenya & nigeria return leg in lagos part of the kenyan contigent were robbed of their valuables at the airport including the late fabisch trademark checked court thus this seems to be their tactic. Nigeria regards Kenya as a threat even though they usually beat us easily 3-0, 3-2 or 3-1. If you would like to confirm this fact then always check the squad being fielded against Harambee Stars against other opponents(it’s very strong squad). In fact all African countries call Kenya ‘a tricky opponent’, meaning they can spoil your party when you least expect like we did for Uganda last year in Africa Cup of Nations qualifier where they expected Kenya to be an easy ride. Same for Malawi in CECAFA.